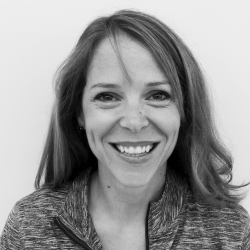 Editor’s Note: Today we welcome our newest member to the AOE Writing Team, Lindsey Moss! 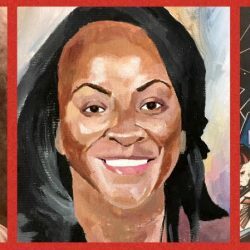 Lindsey is an experienced elementary art teacher from Illinois. Read more about Lindsey here, and give her a warm welcome in the comments section! It’s really difficult to get a teacher’s attention these days; people are inundated with emails, texts, newsletters, and school announcements. Even the postings on the fridge in the teachers’ lounge seem to be ignored. But, I NEED my staff to know certain things about my art program. So, I talk to them where they can’t avoid me and I have their undivided attention… I talk to them in the bathroom. Three years ago, I began to notice only my closest friends on staff were actually reading the entire email I sent about the “back-to-school supplies” that are SUPPOSED to go to the art program (or maybe people were consciously hoarding my Sharpies?). Either way, I was really frustrated. Technology makes everyone reachable, but simultaneously, it makes everything ignorable. An “old school” paper newsletter in teacher mailboxes wasn’t working either. 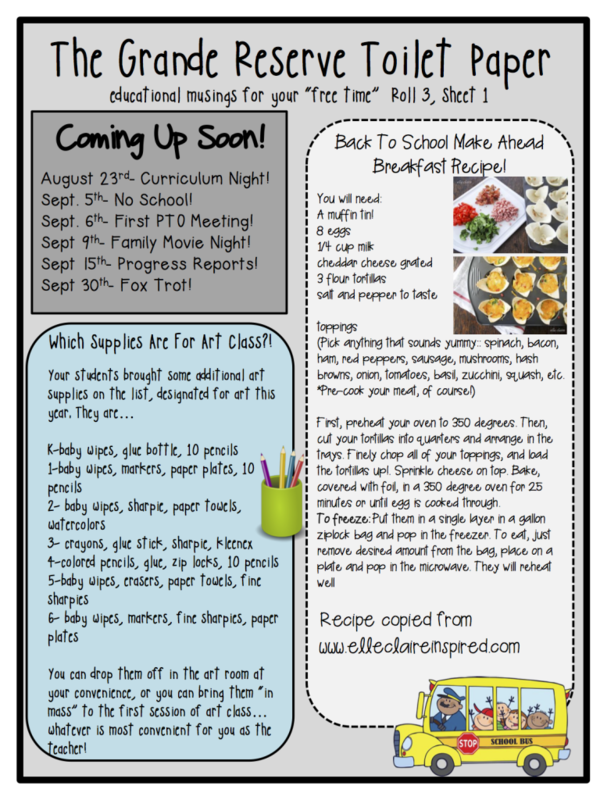 There was too much competition with all the PTO flyers and IEP updates! So, I went where there was NO competition: the staff bathroom. 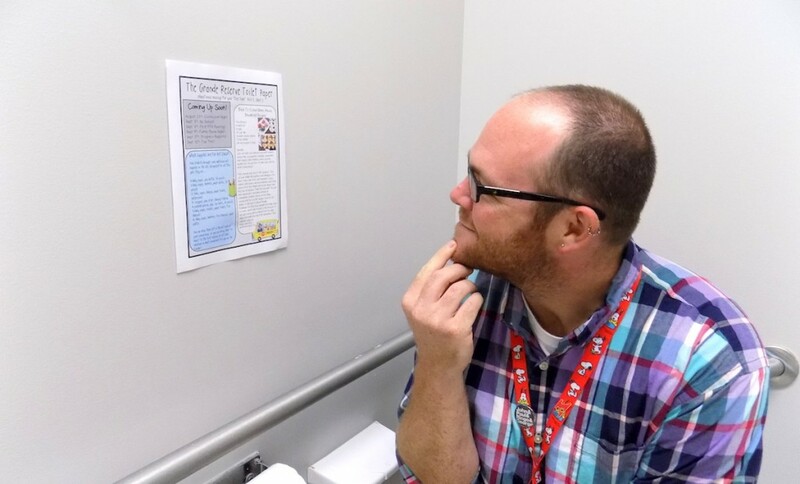 Using a publisher template, I drafted “The Grande Reserve Toilet Paper,” a bi-monthly bathroom publication I tape (at eye level) in every adult bathroom in the building. At first, I published anonymously. I mean, come on…how much weirder can the art teacher get? The response was immediately positive, and I admitted responsibility after the second issue. Three years later, I am still authoring this public (restroom) publication, because it WORKS. Everyone reads what I want them to because they are, quite literally, a captive audience. Along the way, I have learned a few things that make a “Toilet Paper” more successful. 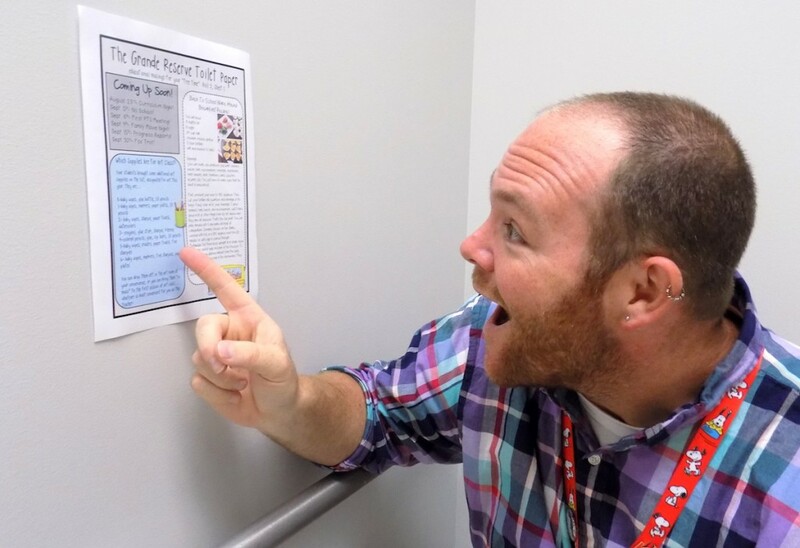 I try to incorporate any topic that is light-hearted, fun, and can be read in one to three minutes, because you know teachers can’t be in the bathroom too long! 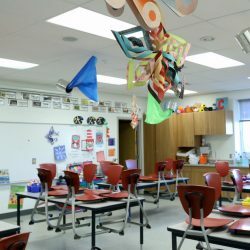 The most positive thing about these activities is that they bring teachers into my art room: to ask for more information, solicit art advice, or just see the other entries. 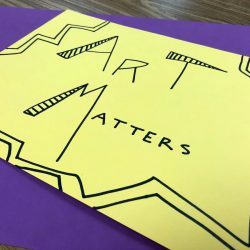 These are the first steps toward developing the supportive teacher relationships that will matter to my art program in the long run. If you’d like, you can download an example issue below! 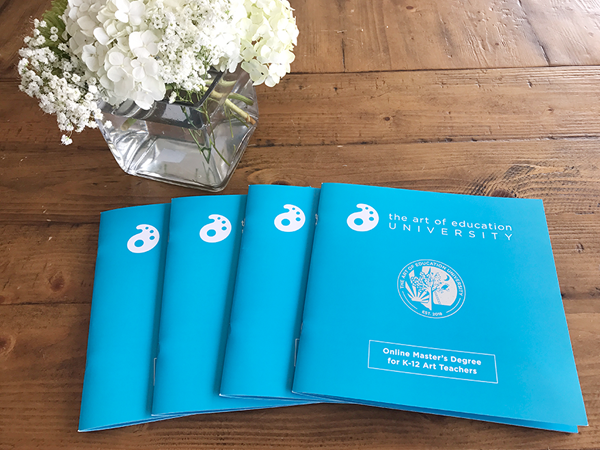 As an art teacher, you definitely have an agenda to promote! So, get into your bathroom and start writing! How could you implement an unconventional newsletter in your building? What types of topics would you incorporate? I absolutely love this idea and will be incorporating it asap! I’m glad you can use it! This is such a great idea…Thank you for sharing! I love this idea!!!!! Thanks for sharing. Really funny and clever Lindsey! welcome to the AOE team. Great article Lindsey…thank you and thanks for picture Mr. McHugh…you are quite brave. Thanks! I am lucky to work with such talented (and brave) people!